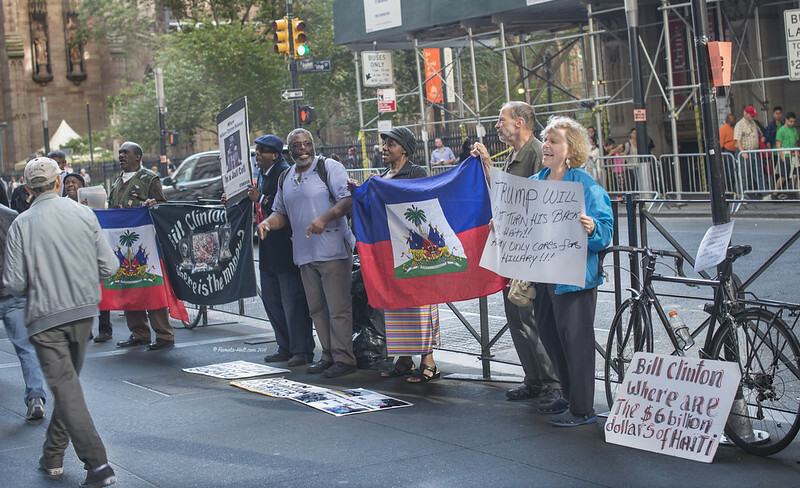 This protest outside the offices of New York Attorney General Eric Schneiderman’s office demanding an investigation into the theft of billions of dollars by the Bill and Hillary Clinton from the Haitian people brought together an unlikely group. Notably absent are members of Black Lives Matter — perhaps because their major donor is George Soros, who happens also to be a major donor to Hillary Clinton’s campaign. 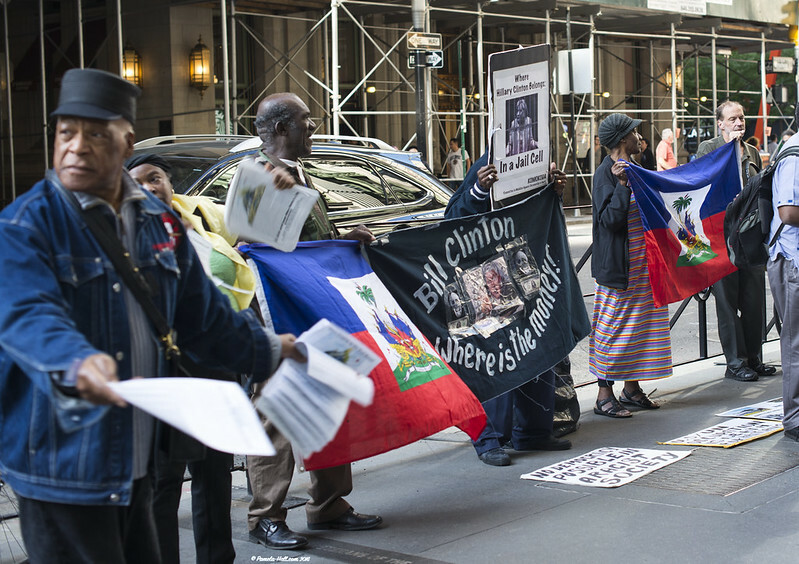 Apparently, “Black Lives Matter”… unless you’re Haitian. 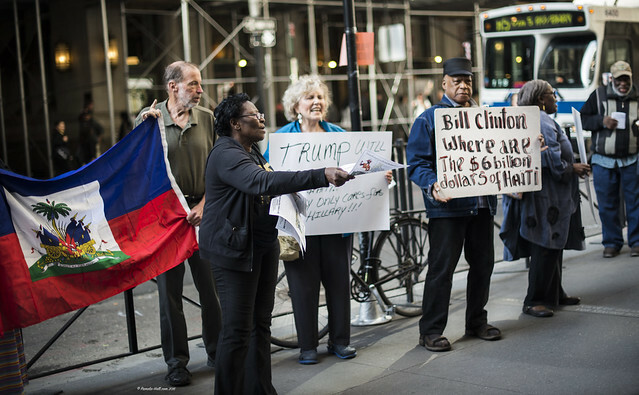 The NYC Haitian Community (& allies) held a press conference (of sorts) to “denounce Schneiderman`s double standard in deciding to persecute the Trump Foundation for fraud while ignoring the lack of audits and billions `missing` from the Clinton Foundation.” They demand the Clinton’s return BILLIONS stolen from Haiti. 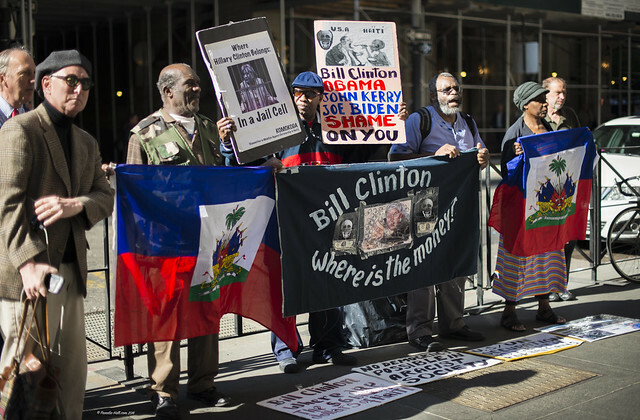 “The Clintons gave lucrative no bid contracts for Haiti earthquake cleanup, reconstruction and housing to cronies who in turn gave them high-priced speeches and `donated` to their foundation. 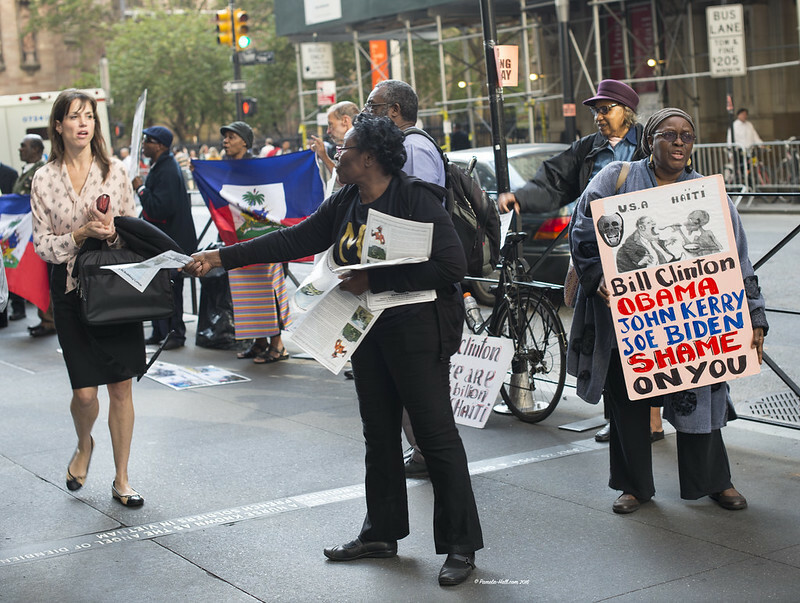 WHO were these protestors – I’m confused because Lynn Stewart’s husband, Ralph Poynter, was handing out flyers. Workers World? and Democracy Now? 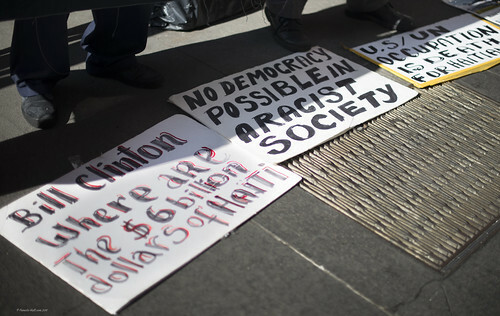 Participants included Ralph Poynter – activist & community organizer, Betty Davis; civil rights activist and writer Arvind Kumar; Frank Francois, community activist and Green Party candidate for US Congress in the 5th District and writer- investor ,Charles Ortel,whose investigations revealed financial fraud at General Electric and AIG. 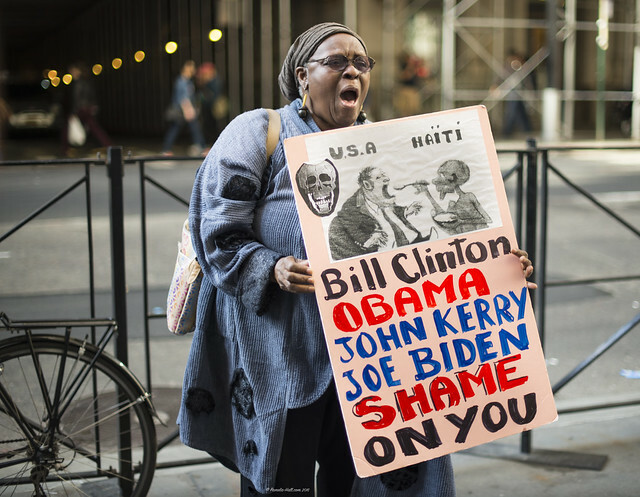 “With Haiti and her wonderful people under assault again, it should grieve all Americans that Bill Clinton and his false-front network pretending to be “charity” refuses to account for billions of dollars in missing aid money. What kind of people divert rescue funds from poor neighbors who share so many common bonds? 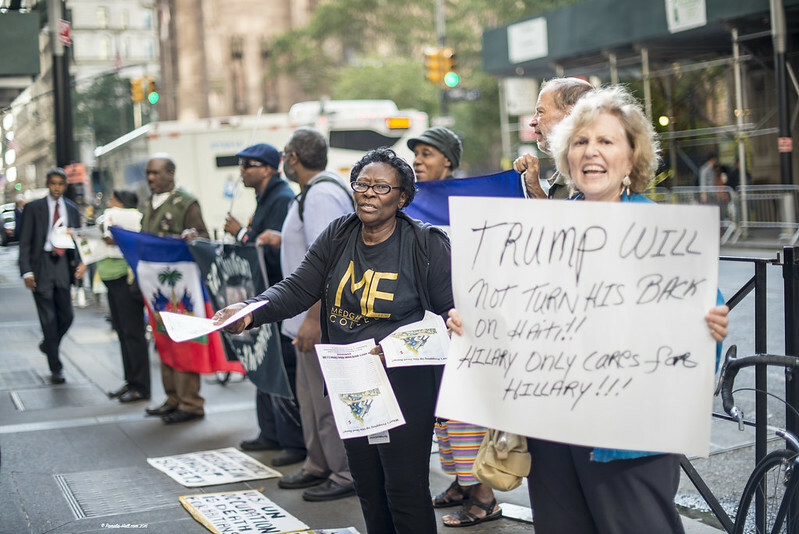 The people of Haiti deserve a bright future… Thank you for prodding Americans to do the right thing, for exposing Clinton family disaster cronyism and for your fortitude. 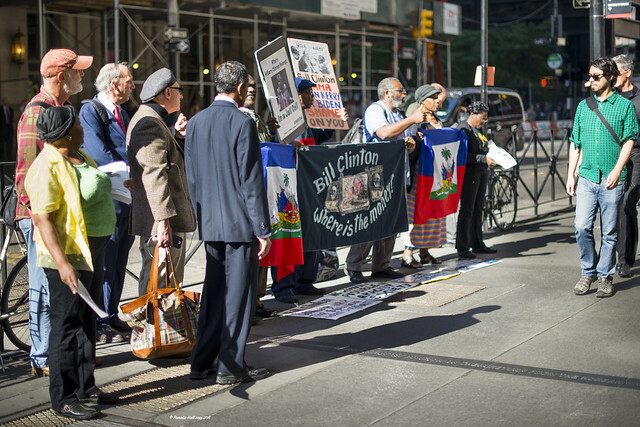 People of Indian descent stand with the people of Haiti in opposing the Clinton Foundation. We are aware of the Clinton Foundation’s shenanigans as they have attempted to interfere in Indian politics. Sant Chatwal who was the trustee of the Clinton Foundation was wanted for committing a crime in India and was guilty of corruption in the US. His son Vikram Chatwal was arrested for trafficking drugs. Soon after Hillary Clinton became the Secretary of State, Vikram Chatwal donated a large sum of money to a person in India who manufactured “human rights” reports against India but which were aligned with Hillary Clinton’s anti-India agenda. Chatwal’s name also came up in what was known as the cash for votes scam in India. *At the time we are sending this email the Haitian Government has upgraded the death toll from Hurricane Matthew to 283. We have to note that the authorities have yet to reach some severely affected areas of the country. As unbelievable as it sounds Bill Clinton has published a tweet directing people wishing to help Haiti in the aftermath of the hurricane to donate to the Clinton Foundation and their network of crooks in Haiti. [….] we would like to thank all well meaning people who have expressed their concerns and positive vibrations toward our people with regard to Hurricane Matthew which has ravaged the Southern parts of Haiti. […] We thank everyone who is eager to make a donation but given our experience with international NGO’s such as the Red Cross and the Clinton Foundation stealing moneys donated to help our people, we ask people not to repeat the same mistake they made in the past. 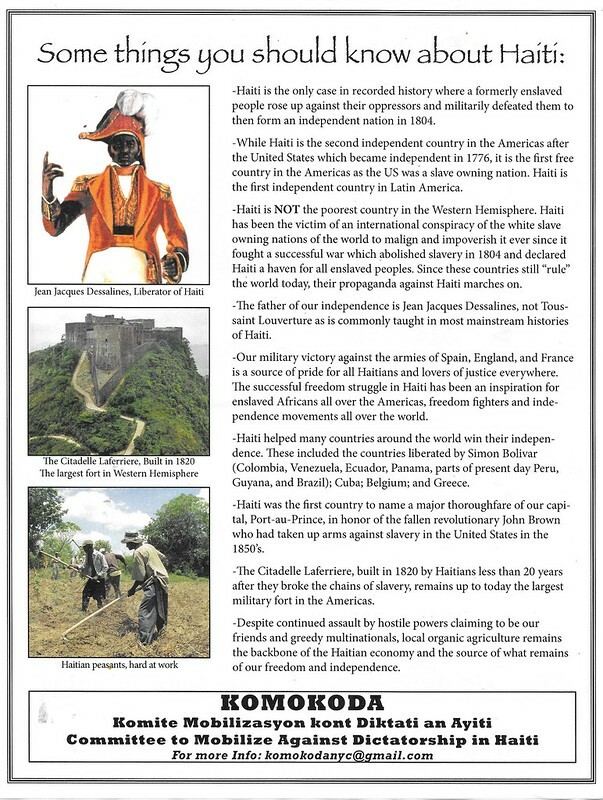 … the Haitian people… have no idea what they have done with all the billions meant to help Haiti that have been in their charge: Secretary of State Hillary’s control of all USAID money, Bill’s UN Special Envoy money, Bill’s Interim Haiti Recovery Commission money, Bill’s Clinton-Bush Fund money, and of course their Clinton Foundation money. ….the Clinton Foundation …. collects billions on behalf of poor non-white people all over the world; keeps billions for themselves and spends a few million on silly projects that will never allow their victims to get on their feet. […] This Foundation is no more than a channel for the Clintons to enrich themselves, keep those loyal to them employed and amass a war chest so they can stay in power and out of jail. We are telling the American people that[….] in this race Donald Trump is the lesser evil facing the US and humanity today. The REAL Hillary exposed remains in reach of the presidency. Hillary skates on charge after charge. No matter how many laws they break. Wake Up, America! Tags: Bill Clinton, Clinton Foundation, Clinton Global Initiative, Eric Schneiderman, Haiti, Hillary Clinton. Bookmark the permalink.